A few weeks ago we posted 9 Ways to Build Your Own Social Network, a review of several hosted, do-it-yourself white label social networking solutions. Conspicuously missing from that round-up were many additional companies that specialize in the creation of social networks. These companies were intentionally overlooked in the first post because we wanted to focus on self-service websites. In this second post, we cover these remaining companies, all of which offer either made-to-order solutions or downloadable software. When reviewing Ning, KickApps, et al., I was able to test the products first-hand by creating social networks from scratch and for free using online wizards and tools. Testing this second post’s solutions was more difficult because they all require the formation of business relationships and/or local installation and configuration. But we were able to test many of the launched social networks that actually use these solutions, and we also interviewed several of the companies. 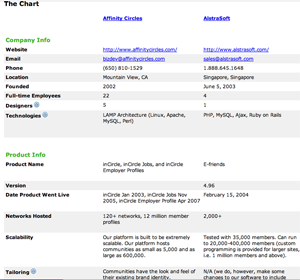 Detailed information about the companies is presented in the interactive chart to the right, which features additional information in popups and the ability to select only particular companies for comparison. The following companies are included in the chart: Affinity Circles, AlstraSoft, Blogtronix, Boonex, Broadband Mechanics, Converdge, Crowd Factory, DZOIC, GoLightly, introNetworks, Kwiqq, Leverage, Lithium, LiveWorld, Neighborhood America, Omnifuse, Pringo, Prospero, SelectMinds, Small World Labs, Social Platform, Sparta Social Networks, Telligent, ThePort, VMIX Media, Web Crossing, Web Scribble Solutions, and Webligo. Not included are Dave Networks, Five Across (absorbed by Cisco), PHPizabi, Pluck, and Village Engine because they did not respond to our inquiries. phpFox responded but opted not to fill out our questionnaire. Your initial reaction may be “wow, this market sure looks overcrowded.” In the longer run, competitive pricing may force many of these companies to drop out of the business. However, I was surprised to hear several of them say that current demand for social networking services is overwhelmingly high. One of the representatives I spoke with half-kiddingly said that he did not actually want TechCrunch coverage of his company because he already has to turn down multiple project requests per week. It will be interesting to see over the next few years whether this demand further intensifies as potential customers realize the value of niche social networks, or whether it slackens as people get over the hype surrounding this aspect of Web 2.0. Many of these companies are targeting large, well-established organizations with deep pockets. Scan the chart and you will see big-name media companies, educational institutions, and corporations such as Reuters, Campbells Soup, Harvard Business School, Citrix, Oracle, HP, Microsoft, Fortune, Cingular, Comcast, Land Rover, American Express, ABC News, ESPN, and HotMomsClub.com (okay, so they’re not all big names). The companies in this round-up have some advantages over those in the first round-up when it comes to providing for well-established organizations. First, these companies can protect and enhance their clients’ brands by delivering highly-tailored social network components that integrate seamlessly into existing websites. This is especially true for the subset of social networking companies that provide made-to-order solutions rather than downloadable packages. However, even downloadable software can (at least theoretically) be retooled by the clients’ developers to match an existing look and feel. Secondly, many of these companies provide greater ownership of social network data and/or software. While a groupie running a Smashing Pumpkins fan network on Ning does not care that the network’s data is locked up in Ning’s system, Wells Fargo and Ernst & Young prefer to keep their communication systems much closer to the vest. Corporations often need to know that their data is safe and trackable for both dependability and legal reasons. Social network ownership is often ensured by putting the software and data management entirely on the client’s servers, or as is the case with Blogtronix, delivering the hardware and software together as an appliance, if demanded. However, even the hosted solutions among these companies eagerly emphasize that they respect their clients’ ultimate ownership of data on their servers. Thirdly, several of these companies claim to develop closer, longer-lasting relationships with their clients. They provide information sessions at the beginning of their relationships, collaborate during the design process, and may even help market the social networks and provide ongoing content moderation support. Fourthly, these companies can be very flexible when it comes to how much of the work their clients want to take on themselves. While they all provide complete social networking packages, many also support the widgetization of their features so clients can embed social networking functionality in regular pages. Some, such as Crowd Factory, also allow for the client to take complete responsibility for front-end programming and use an API to plug into a full-service back-end. While all of these companies provide social networking functionality, they differentiate themselves in several ways. AlstraSoft, Blogtronix, Boonex, Broadband Mechanics, DZOIC, phpFox, PHPizabi, Telligent, Web Scribble Solutions, and Webligo form the minority that provide non-hosted solutions (although Blogtronix and Broadband Mechanics provide software as a service, or SaaS, solutions as well, and others might be willing to locally install their traditionally hosted platforms). Some of them, such as Crowd Factory, Prospero, and Neighborhood America mostly concentrate on serving media companies. Affinity Circles provides job-oriented social networking solutions for alumni networks and trade associations. SelectMinds exclusively builds private networks for the employees of corporations. And Kwiqq aims to become a long-standing technology partner with the companies it serves. A few provide unique features not found in your average social network. Leverage and introNetworks both have strikingly similar visualization features that enable network members to easily locate other members who share their backgrounds and interests. DZOIC’s Handshakes Professional product allows members to save their searches and get notified when new members match search criteria. ThePort, which has been around since 1999 and focuses on creating niche communities, differentiates itself by integrating its social networks with its own news aggregation and start page services. Speaking of older companies, the players in this market also vary significantly in age (at least when considered in light of other Web 2.0 companies). The oldest of the group, Web Crossing, was founded in 1986, and others were originally born as Web 1.0 companies: LiveWorld in 1996, and Neighborhood America and Sparta Social Networks in 1999, for example. As representatives for Prospero (founded in 2000) attest, these older companies have needed to changed their focus in the last couple of years to accommodate a new preference for “me” technologies over “we” technologies. However, these companies also claim that their experience, business relationships, and internal structure have prepared them well for this transition and equipped them to deliver mature products. Check out the chart for more detailed information about these companies. If you have personally dealt with any of these companies, please share your experience in the comments below.